Head of the Binyamin Regional Council Avi Roeh: I hope the government will scramble to find a solution to prevent the razing of Migron. The head of the Binyamin Regional Council, Avi Roeh, said on Sunday that he hopes the Israeli government will find an appropriate solution for the residents of the community of Migron. Roeh spoke to Arutz Sheva several hours after the Supreme Court rejected a compromise deal between the government and the residents of Migron and set a new deadline for the eviction of the residents. The three judges, Supreme Court President Asher Grunis and judges Miriam Naor and Salim Jubran, gave the government until August 1 to evict the residents. Migron was built with government help on land whose ownership is unclear, except for the fact that it is not state land. Peace Now launched a lawsuit before the Supreme Court aimed at destroying the community. Since only Magistrate's Courts adjudicate land ownership in Israel, the question of who owned the land was not decided in the Supreme Court, although it seems that some of it was given by King Hussein to Jordanians who never laid claim to it. Jordan was an occupying power in Judea and Samaria from 1949-1967. The compromise, worked out by MK Benny Begin (Likud) with much difficulty, would have had the residents move to a small, nearby area that is uncontested state land and have the present Migron houses used by the government for other purposes. An earlier compromise moving them to a large, new suburb to be built near the existing community of Adam on state land was worked out by the Judea and Samaria Council two years ago, but the residents rejected it, still hoping to save the existing community. In both compromises, the residents were to remain in Migron until the alternate houses were built. The new compromise was agreed to by both government and residents in order to avoid both the violence that accompanied the destruction of the houses at Amona in 2006 and the bitter split in the nation that occurred due to the expulsion from the Katif Bloc in 2005. The courts, however, made saving Migron in its present location an impossibility and may have made the new compromise unachievable. MK Zevulun Orlev of the Jewish Home repeated his position Sunday that the three-man faction would leave the coalition if Migron is torn down. 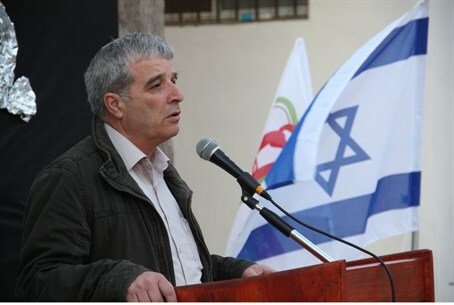 Orlev called for the ratification of the Outposts Law which he has submitted to the Knesset. This law, he explained, "will provide a just and humane solution for all sides. The Jewish Home New NRP will leave [the coalition] if a decision to raze Migron is made, he said, "because there is no justification for it."